At the Program Features step of the wizard, you can select what components the setup wizard will install on the machine and choose the installation folder. For service providers the setup wizard will also offer you to install Veeam Cloud Connect Portal. For more information on Veeam Cloud Connect Portal, see the Veeam Cloud Connect Guide. Click the hard drive icon next to a component. 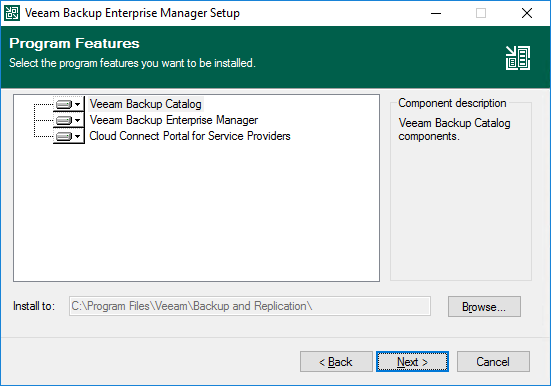 If Veeam Backup Catalog or Veeam Cloud Connect Portal is already installed, the setup will exclude them from the list of installed components. The setup wizard also installs components in the background. For more information on the installed components, see Enterprise Manager Components. On the right of the Install to field, click Browse. In the Browse for Folder window, select the installation folder for the product. The default installation folder is %ProgramFiles%\Veeam\Backup and Replication.